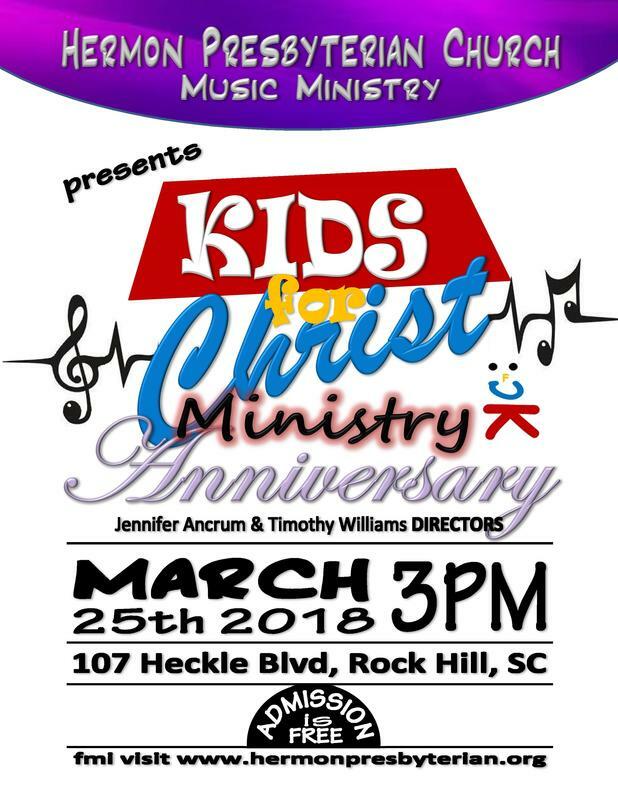 The Hermon Presbyterian Church’s Kids for Christ (KFC) Music Ministry, under the direction of Jennifer D. Ancrum and Timothy Williams, would like to invite you to our fifth annual concert on March 25, 2018 at 3:00pm. We will be featuring selections from the group’s repertoire and various musical interpretations presented by the group during the course of the concert. We pray that you will be able to join us for this annual event for the children. We would like for you to assist us with our concert and render two (2) selections which consist of song, mime or dance during our concert. Please contact our President, Irvin Jenkins, either directly at 803-412-5608 or indirectly at irvinjenkinsjr@hotmail.com to indicate if you are ABLE to participate. You can also RSVP by filling in the form above. If you cannot participate, we would appreciate your prayers of thanksgiving and prosperity for us in the past, present, and future of the Hermon Presbyterian Church Congregation and our Music Ministry.